Gas Stoves or Electric Stoves? With a wealth of choice, the time has never been better to opt for either a Gas or Electric stove depending on your preference. Whether you intend to create a focal point in your main living area or are looking to add ambiance to a smaller area or room, Gazco offer a wide range of both Gas and Electric stoves to suit your requirements. From modern & contemporary to more classic, traditional looks, there is a style that is perfect for you and your home. Home » Appliances » Stoves » Gas Stoves » Buying your gas stove » Gas Stoves or Electric Stoves? If you are currently looking to invest in a stove, Gazco has a range of stunning appliances suitable for your home – even for those without a chimney! 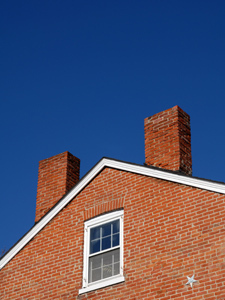 The type of chimney or flue system you have usually dictates your choice of stove, by visiting our dedicated Chimneys and Flues web page, you will have an idea of the types of chimney and flue systems available. After identifying your chimney (or confirmed you do not have one), take note of the symbol that represents this, as this has been used throughout the web site to represent the stoves that are suitable for installation in your home. To assist you in selecting the right stove for your home, a general guide to which models can be installed with the various flue types is given on each product page. Always seek advice from your local Gazco retailer if you would like to find out more information about the suitable stove for the type of chimney or flue you have available and before making a decision in purchasing an appliance. Homeowners are becoming increasingly aware of the rising household expenditure; investing in a highly efficient gas stove will not help you reduce your monthly bills but it will also create a magnificent centrepiece in your home. Gazco has the latest up-to-the minute contemporary designs as well as more traditionally styled gas stoves that will create the ultimate wow factor in your home. For homes without a chimney, Gazco offer a wide selection of beautifully designed balanced flue gas stove models that can be installed by flueing directing through an external wall. Properties with a chimney breast can choose from the extensive selection of conventional gas stove appliances available from Gazco. 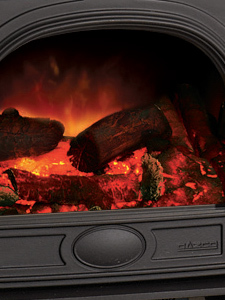 All Gazco gas stoves on this web site can be specified for use with either Natural Gas or LPG. Natural Gas is provided though mains pipelines, whilst LPG is usually supplied to homes in rural areas from a tank in the garden or gas bottles. Further, you can find out each gas stove’s individual efficiency rating under the key fact’s section. If you would like to find out more about the cost of running a gas fire, visit our FAQs page for an overview. It’s never been easy to get the warm and inviting atmosphere of a real flame fire with all the convenience, versatility and efficiency of electricity. Gazco has created a beautiful range of electric stoves that provide a versatile and stunning focal point for any home without the need for a chimney! 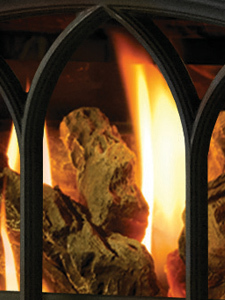 Today’s electric stoves create highly realistic log effects which is brought alive by Gazco’s unique Veriflame technology. These individually hand painted ‘logs’, perfectly mirrors the look and the atmosphere of a real wood burning stove. Electric stoves also include the option to use the flame effect independently of the heat output which means no matter the temperature outside, you can enjoy the charming and alluring visuals.